The health fee provides the opportunity to receive quality, multi-disciplinary healthcare, wellness and health maintenance within a few steps of campus classes. All GT students and their spouses/partners may use health services. Students taking 4 or more credit hours pay a health fee each semester. Students taking less than 4 credit hours and all students' spouses and domestic partners may elect to pay the health fee or choose to use the health services on a fee-for-service basis. Note: The student is responsible for charges associated with their spouse or domestic partner. Charges incurred, and not paid at the time of service, will be uploaded to the student bursar account. Also, the health fee is not insurance and cannot be waived. The Health Fee covers unlimited visits to a clinician in Primary Care and Women’s Health. Limited visits to Psychiatry. Students taking less than 4 credit hours and all students' spouses and domestic partners may elect to pay on a fee-for-service basis. Charges are incurred for all services rendered at a reduced cost. Students cannot use the online appointment system and appointments must be made in person or over the phone. Non-registered students eligible to return within one semester. Graduating students (student only) for one term post-graduation. Affiliate Postdoctoral Scholars, J1 Scholars and OPT participants are eligible to use services of Stamps Health Services Pharmacy and Tech Dentistry at Stamps Health Services. Note: Under fee-for-service, students, spouses and/or domestic partners may fill prescriptions for the duration of the ordered therapy. This does not apply to spouses and/or domestic partners of students who have graduated. Allergy: With payment of the health fee, allergy injections are available for an additional fee of $100 per semester for fall and spring and $70 for summer semester. With fee-for-service, allergy injections are available but charges are incurred at each visit. Immunizations and Travel: With payment of the health fee, immunization and travel appointments are included but charges are incurred for the vaccines. With fee-for-service, immunization and travel appointments incur a charge at each visit as well as charges for the vaccines. 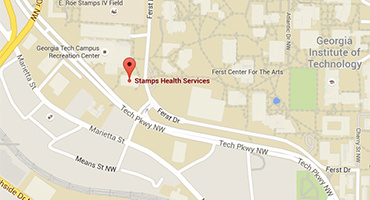 Most services rendered at Stamps Health Services are at no additional charge. However, some lab tests, specialty clinic visits and prescriptions have an additional charge. Please check with our staff if you have questions about the cost of your care. Payment for service is due at time of service.